John was born in Killeen, Legan, c.1891. He was a grandson of James and Anne Cox. He later moved to Manchester, England. Pte Cox enlisted in the Connaught Rangers in Boyle, Co. Roscommon, and in 1911 appears to be serving with the 1st Connaughts in India. He entered the war on the 26 September 1914 and was one of the first Longford men in the war, which entitled him to the 1914 Star. 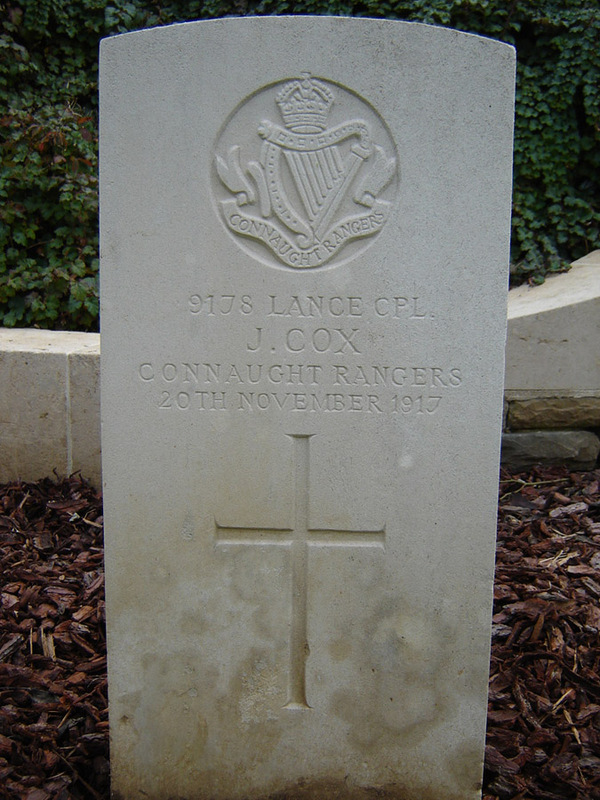 He initially served with the 1st Connaught Rangers, who joined the war on the 26 September 1914, when they arrived in Marseilles from Karachi, India, where they had been previously; this strongly suggests that John was an existing member of the British Army prior to WW1, known as the 'Old Contemptibles' at the beginning of the war. John would have taken part in key actions such as the First Battle of Messines, the Battle of Festubert, the Battle of Neuve Chapelle, the Second Battle of Ypres and the Battle of Loos. John transferred to the 6th Battalion some time after they arrived in France in December 1915. He was killed in action likely during the Battle of Cambrai. LCpl Cox's army record is not available, possibly damaged during WW2 nor was any next-of-kin noted on his register of effects, therefore we have very limited personal information on him. Indeed, his medals are noted to have been returned.